Sadly, Sadie's owner passed away now she and her "brother" Homer need a new forever home. They are a wonderful sweet natured pair and need to find a new home where they can be together - a package deal! They are in foster care at someone's home but can be brought to where the rest of the dogs are to be met. 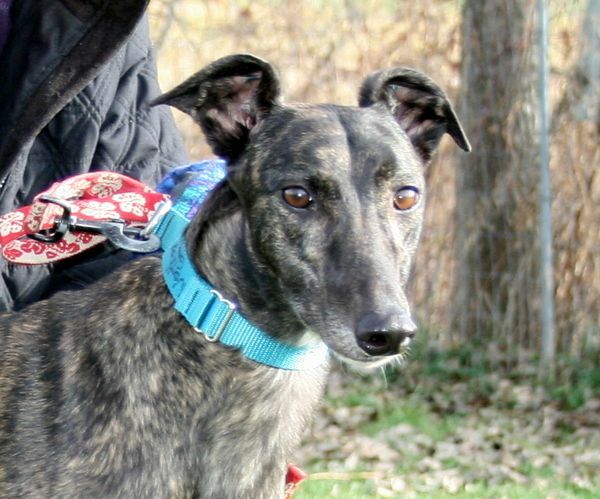 adopted hound from Northern Greyhound.....Note: I said FIRST ...............because, NOW, we have two !!!! Sonata, now Sadie is home safe and sound in Bombay AND, might I add is adjusting just fine. She is discovering what the GOOD LIFE is all about. She has stolen OUR hearts...........but Homer is not quite sure YET if she has stolen his. He's a bit confused and alittle concerned that, although he is still King, why the Queen is trying to steal his throan!!! He is trying to figure this all out and we are sure with alittle time, patience, and alot of love, he will be just fine. We do know he is very tolerant of her as he is a kind soul anyway. We are not worried, the heiarchy will be solved and the good life, as mentioned, will go on for them. Again, thank-you for all the work and devotion all of you give in the lives of these greathounds !!! Thank-you again, and we will periodocally send pictures and give you up-dates on the "kids" !! !